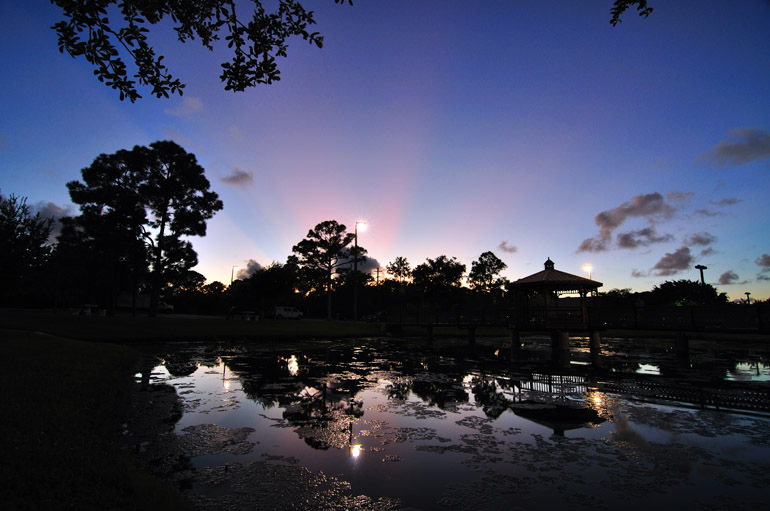 Facing west (taken at 7:37 p.m., with sunset at 7:16 p.m.): The Space Coast has seen some great sunsets recently, with large clouds on the horizon filtering the light and sending distinct rays through the atmosphere. On Wednesday night, I didn't bother to take any photos because I had too many newspaper stories to edit. But on Thursday night, I somewhat belatedly stepped outside work to check on the post-sunset sky and took some photos from the edge of a pond behind the building. The putrid body of water has appeared in many other photos I have taken at work. The view of the large clouds that gave rise to the streaks of light, though, was blocked by the trees. 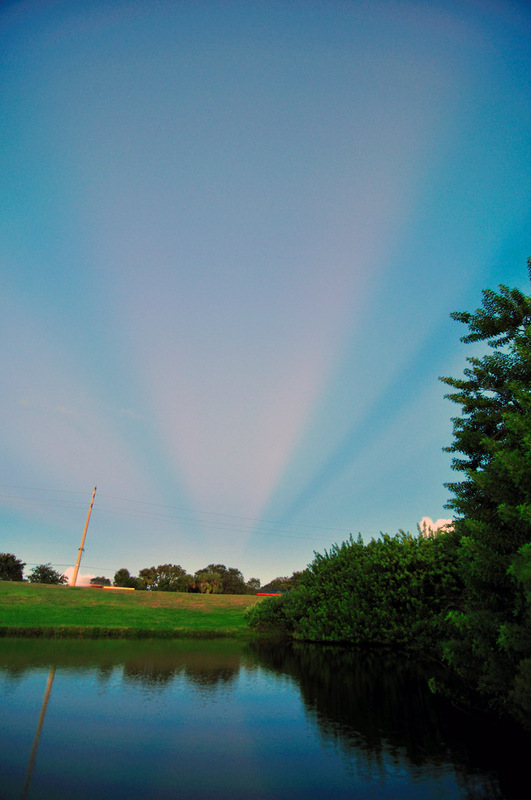 Facing east (taken at 7:34 p.m.): It's amazing that I had never witnessed this sight before moving to Florida, but for the third time in my life and for the second time in as many weeks, anticrepuscular rays appeared in the eastern sky, opposite the sunset Thursday. In Maine, where I had spent my summers before moving to Washington, then to New York, the clouds tend to be much smaller. Thus, I suspect that this phenomenon occurs much less frequently in regions without the cloud-building capabilities of more tropical climes. Hey Andrew My name is Rosie i Go to the princeton Elementary school. Remeber when you showed us that presentation of pictures. looking at your blog and the pictures on it i think that the nature ones are the best. I hope that you will come and visit our school again soemtime in the near feature.... Thanks for the visit.